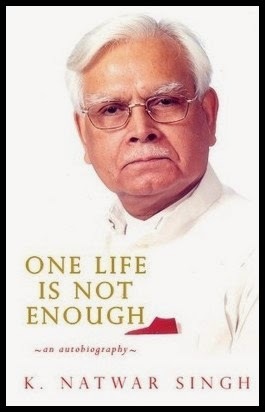 One Life Is Not Enough – Former diplomat K Natwar Singh’s new book will make a good fodder for gossips in Delhi’s corridors of power, at least for the next one week or so, as Singh's is an inside story of the corridor’s biggies with no holds barred. In fact, Singh’s 31-year-long diplomatic career and then the political journey that abruptly ended with oil-for-food scam, were well documented. So, BoI here picks out a few nuggets about Singh’s preferences in civil services exam, and the limited choices he had to splurge his huge salary: Rs 350 per month in 1953. 1. After appearing for the written part of the civils in October 1952, Singh went to UK. Also, he had a holiday in Holland, Belgium and France. Whe he returned to India, a telegram from the UPSC was waiting for him. His interview at UPSC’s Dholpur House was fixed for January 9, 1953. 2. The interview board was presided over by the then ICS officer RN Banerji. The other members included the then MEA joint secretary BHFB Tyabji and IPS officer PL Mehta. 3. Singh gave only two options of preference: IFS and IAS. He was asked in the interview why he gave only two choices. 4. Upon selected as an IFS, he was asked to report at Metcalfe House on April 14, 1953 for probation. Those were pre-LBSNAA days, and unlike today when the first sessions of probation are organized in the Mussorie campus, the training then was held in Delhi’s Metcalfe House. 5. Singh and six other IFS officers, all aged between 21 and 24, were invited to South Block by the then prime minister Jawaharlal Nehru. They had a free and frank interaction with Pandit Nehru. Singh was asked a question on China as a potential danger. 6. Singh and his fellow probationers spent five months in Metcalfe House whereas IAS probationers stayed there for a year. 7. One day, Rashtrapati Bhavan sent a car to the Metcalfe House for bringing IFS probationers for a meeting with the then President of India Dr Rajendra Prasad. Remember, all those officers were the most eligible bachelors too. One of Singh’s batch-mates finally married the President’s grand-daughter. 8. In August 1953, Singh along with his other IAS and IFS probationers went to Kashmir on an exposure tour. They met the then chief minister Sheikh Abdullah. 9. In September 1953, the IFS officers had to sail for London, as part of their training. Singh later wrote that he was horribly seasick. Singh was first trained in Cambridge. Then, he spent six weeks in London’s Foreign and Commonwealth Office. 10. The salary of the probationers then was Rs 350 per month plus an allowance of Rs 90. Singh later wrote in an article in The Hindu that they “were hard put to spend it”. After all, petrol used to cost 12 annas a gallon then, and in Connaught Place there were limited choice of restaurants -- Alps, Kwality and Volga. K Natwar Singh served 31 years in the Foreign Service (IFS) and entered politics in India. However the man was corrupt and was caught in UN Iraqi Oil for Food scandal (as per legendary Paul Volcker committee report). Natwar book is simply angry and frustrated with Gandhi family as he was sidelined by them and mocked by Congress for nearly 8 years. It took this guy until 2014 to write the book .. it sounds fishy! One life can never be enough for corrupt people because the avenues and opportunities for corruption are so vast it is not possible to exhaust all the opportunities. Natwar Singhs daughter in laws death under mysterious circumstances was shown as a suicide. The probe was never conclusive. His son is perhaps in the BJP. Thus father and son walked two different ways to safe guard the ill gotten gains. Has it been stashed in Swiss Banks or Benami Accounts ? An old man hankering for some lime light in the sunset of his life. Onne good thing though - he exposed Sonia and Rahul Baba once again. Manmohan Singh will not be forgiven by the coming generations. History will surely expose him.